Sketch-Map 1: showing the proposed Historical District, including historical cabins, outbuildings, shrine, pasture, and spring. 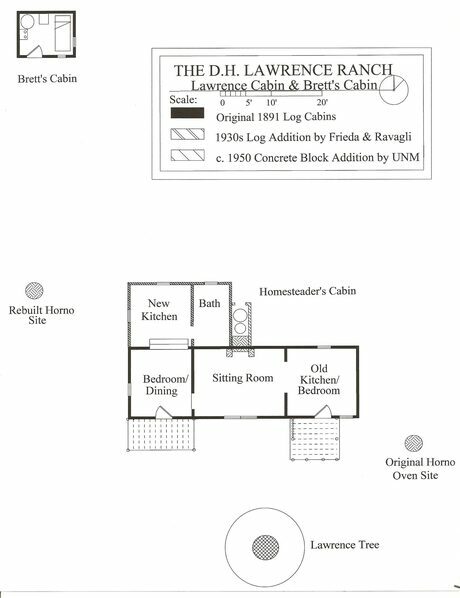 Sketch-Map 2: Showing the layout of the Lawrence Cabin (including the porches Lawrence built and later Kitchen/Bath additions) in relation to the Lawrence Tree, Brett's Cabin, and the estimated location of the original Horno Oven. The accompanying enlargement of the USGS map shows the total property square and the portion we are nominating. The boundary lines for the proposed Lawrence Ranch District are marked in black. (Starting at the northeast corner, go counterclockwise.) Use the gully for the north boundary, head west about 350 meters, and follow the tree-line around the horse-corral pasture. Crossing over Lawrence Ranch Road, continue to follow the tree-line southward around the alfalfa field till it intersects with the 8320 elevation line (swinging around eastward and cutting off the narrow tip of the field), then follow the tree-line again northward till it intersects with the dirt road leading to the Fellowship Cabin, and from that point go about 200 meters due east until reaching the property line. Then follow the property line northward approximately 200 meters until it crosses the gully. 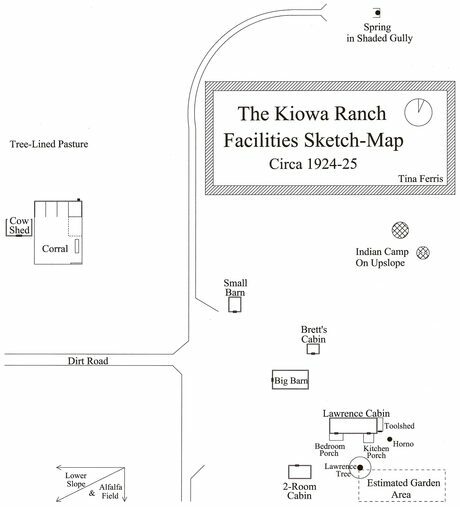 The boundary for the Lawrence Ranch District includes the cabins, memorial shrine, outbuildings, fields, spring, and other sites that have been historically part of the Kiowa Ranch and relate strongly to the life and works of author/poet D.H. Lawrence. This area is referred to by UNM as "Ranch Headquarters" and represents the approximately 10 acres that Frieda wished to remain open to the public, plus an additional six acres of scenic pastureland. The pristine landscape within the boundary area retains a high degree of historical integrity. 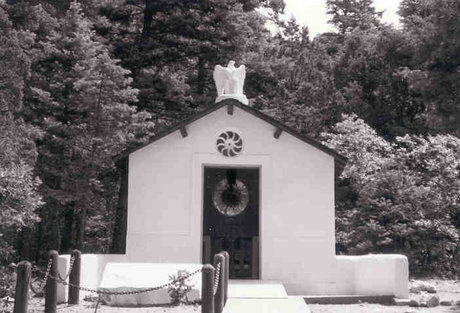 Excluded from the boundary are modern constructions which have no historical significance, such as the concrete reservoir to the southeast; the Fellowship Cabin to the south; Kiowa Village to the southwest; Lobo Lodge, the campsite, and a 200-gallon water tank to the northwest; and a storage garage to the north.